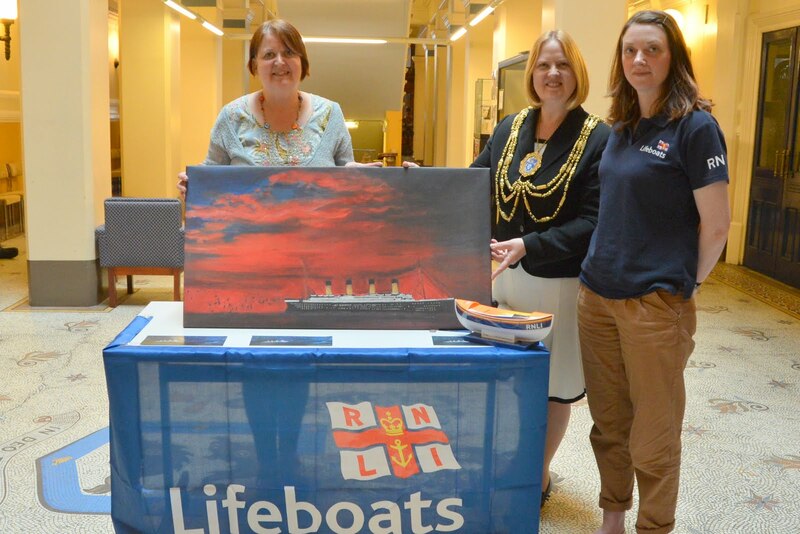 The Mayor of Brighton and Hove, Councillor Anne Meadows, visited Bonny Cummins’ exhibition in Brighton Town Hall, about The Titanic. The exhibition is entitled ‘Ship of Dreams’ and is an immersive installation of paintings prints and collectibles and a short extract from a film of Millvina Dean, a Titanic survivor, which Bonny is making, will be shown as part of the work. All the proceeds from ticket sales will be donated to the RNLI who are raising funds for new life-jackets. Bonny Cummins friendship with Millvina Dean has inspired the paintings and some of them are co signed by Millvina. The journey of Titanic is brought to life under the stunning glass Atrium evocative of Titanic’s glass and mahogany structures and grandeur. Paintings will be displayed on easels and hung from the balconies and majestic staircases. Each Saturday, 12th May & 19th May & 26th May from 12:00pm to 16:00pm, as part of the experience refreshments will be served as part of the exhibition as Millvina loved to spend her afternoons with friends over tea.